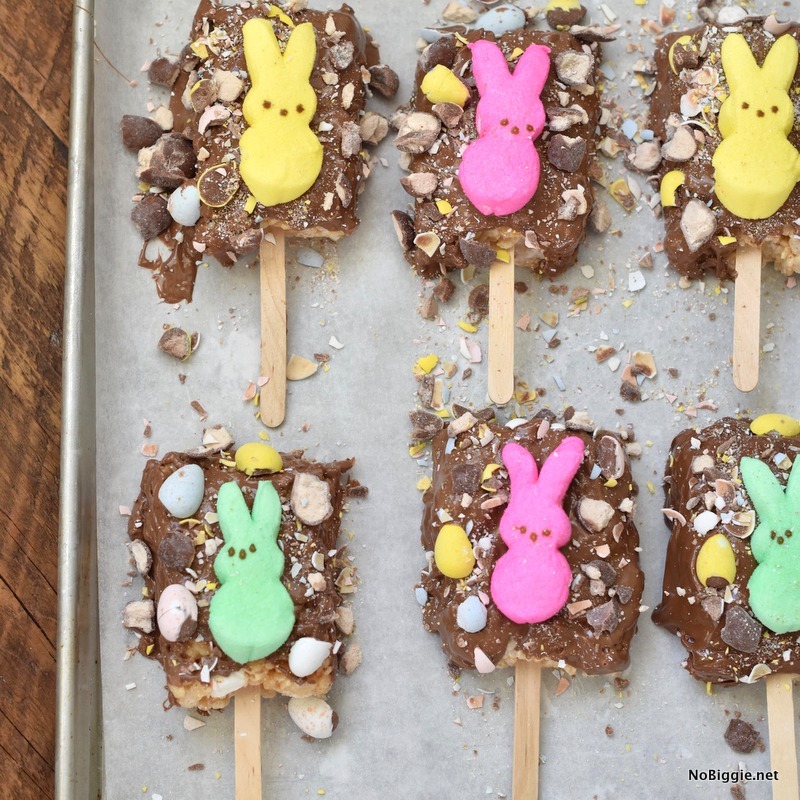 We’re making the ultimate Easter candy chocolate dipped rice krispie treats…aka PeepTASTIC Krispie Treats! 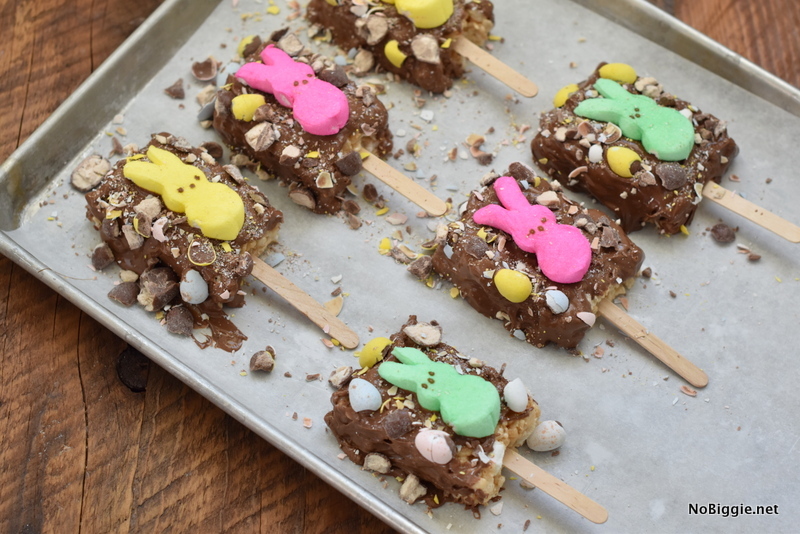 We’ve shared our tips for making THE BEST rice krispie treats every time (I was making them wrong for years…but not anymore)…and NOW we are taking them to the next level adding crushed mini cadbury eggs, crushed malted milk chocolate eggs and PEEPS (of course)! 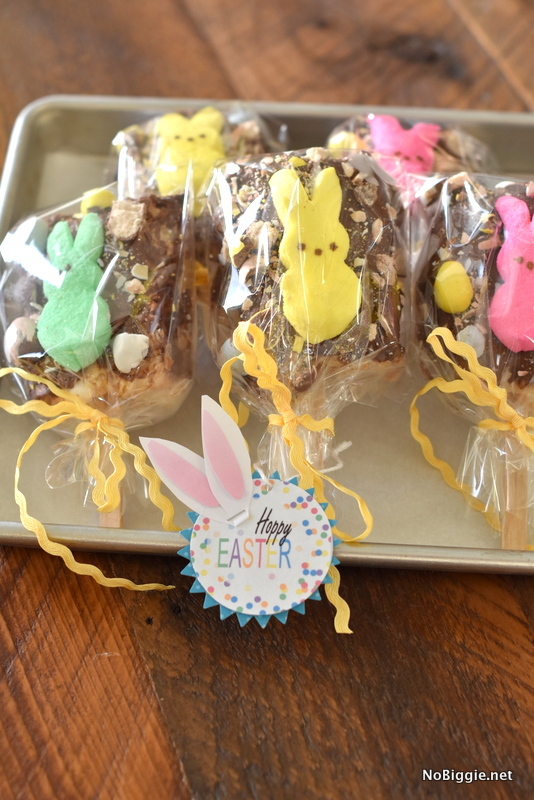 Make someone’s day this Easter with one of these Easter Rice Krispie “Peeptastic” treats! 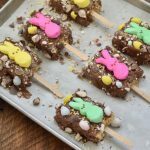 There are so many fun ways to make rice krispie treats fun for holidays, but when you can add iconic candy on top (like a marshmallow peep) your treats become it’s instantly festive for Easter. We made a fun video so you can see them come together. Melt the 1/2 stick of butter in a big pot on your stovetop. Add in the mini marshmallows and continually stir as they start to melt. The consistency of the marshmallows should still be lumpy when the cereal goes into the pot. Dump in the cereal (don't measure), continue stirring until well mixed together. Transfer the treats to your buttered pan. Butter your (clean) fingers to pat the warm treats down into the pan. Butter your knife to cut the treats into squares. Cut the treats while they're still warm. Cut out as many treats as you plan to dip into chocolate. Insert a popsicle stick into each treat. Dip and cover with chocolate. Place on a sheet pan covered in parchment paper. 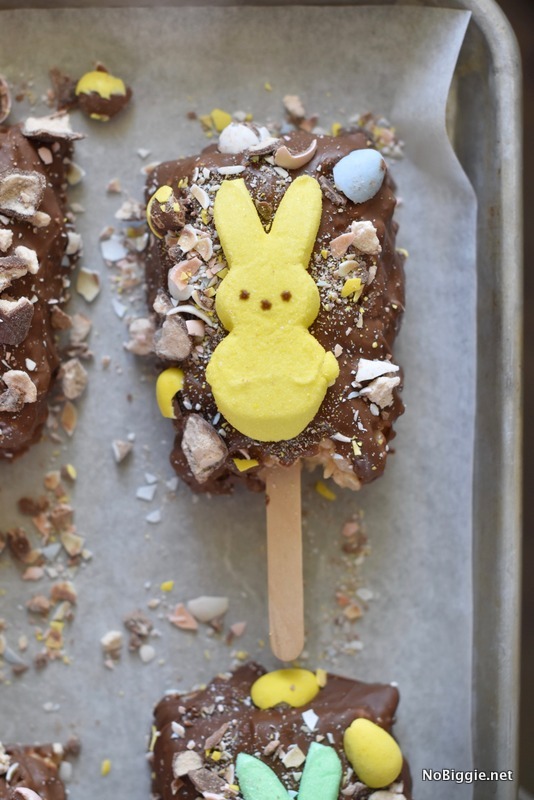 Place the front half of one Peeps bunny in the center of each chocolate dipped treat. Sprinkle with crushed mini cadbury eggs and malted milk eggs. Move sheet pan to the freezer for 10 minutes to let the chocolate cool and set. If you’d like to wrap them up cute and deliver to friends, we have a darling printable Easter gift tag to go with. I hope you guys have a fun Easter with your little ones! Happy Easter!